Three days out and the forecast was looking sketchy to say the least. 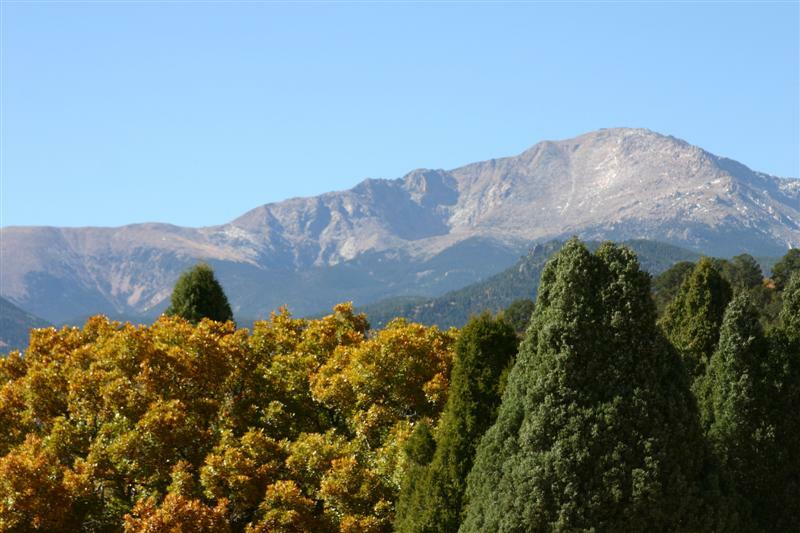 Forecasters were calling for an unseasonably strong cold front to hit Colorado on Saturday night. 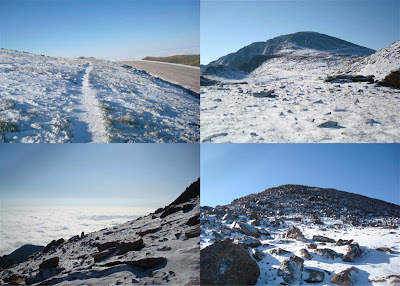 The summit forecast for Sunday featured a high temp of 35 with winds of 5-15 mph. There was a 40% chance of snow/rain showers all day. I trained on a snowy Pikes Peak on 8/1 and it wasn’t what I was looking forward to on race day. On Sunday, I packed every piece of running gear I owned in my bag and departed for Manitou Springs at 4:25 am. I arrived in the dark, but as it lightened up, I noticed there wasn’t a single cloud in the sky. It remained that way the entire morning. My usual annoyance with a botched forecast was easily replaced with relief. The weather couldn’t have been better! As we all lined up at the start, we got a good glimpse of the peak lit up by the sun. It looked so far away! They had four high school aged girls sing an acapella version of “America the Beautiful”. Let’s just say it brought tears to my eyes. The song was beautiful, Pikes off in the distance was beautiful, and I think I was starting to grasp what was about to happen. About a minute before the start, they introduced Arlene Pieper to give us a “Ready. Set. Go.” As I mentioned last Friday, she was the first woman to ever run a marathon in the US. She accomplished this fifty years ago right here at the PPM. I was so inspired to see her and take in just how huge that must have been and still is! Well, she did her thing and we were off. The first mile was on uphill paved roads as we meandered through town towards the Barr Trail. My strategy was to be conservative, but steady in my ascent. There are so many places you can blow your entire race if you try to run too fast. Once on the trail, things got a little crowded. There was room to pass, but you needed to be careful not to expend too much energy in the process. I got to the top of “The W’s” feeling great. The W’s are a steep section of fifteen switchbacks at the start of the trail. After about 4 miles, the runners spread out a bit as we were on a long, wider section of the trail heading to Barr Camp. Barr Camp was the halfway point of the ascent. I was still feeling good and encouraged that I was ahead of my expected time. I was getting nervous that my faster pace was going to come back to haunt me above treeline. Ken Chlouber (creator of the Leadville Trail 100 mile race) once said, “Make friends with pain, and you will never be alone.” Well, at mile 9 I was introduced to a friend that would be my faithful companion for the rest of the race. You see I accidentally attempted a 50 yard field goal kick with a large rock embedded in the trail. My middle toe on my right foot was “rocked” with pain. Did I just break it?? I kept running and the pain subsided just a bit. About a mile later, the walking/running combination began. Very few runners actually run the entire course. Above treeline, it is so easy to experience oxygen deprivation by pushing too hard. Despite noticing the air was getting thinner and thinner, I still felt okay and my hiking pace was much faster than I had anticipated. When I got about 2 miles to the summit, Matt Carpenter came flying down the peak. I snapped a cool pic of him as he passed in a flash. He eventually won his 10th PPM with a time of 3:37. The above treeline portion of the ascent was a slog. Walk 30-60 seconds, jog 10-15 seconds, and then repeat. The summit still looks so far away, but those few miles do go by quickly. When I approached the summit/turnaround, I was greeted by an enthusiastic crew of volunteers and spectators. The clock read 3:22, which was 8 minutes faster than even my best case scenario pace. I began the descent feeling pretty good about how the race was going so far. Based on my training run a month ago, I knew it could quickly turn problematic. I’ve learned a bit about running downhill, like try to land each step on your forefoot and not your heel. Take small, fast steps to control your speed and impact. Keep your body perpendicular to the trail and try to “hurdle” rocks & roots instead of stepping on them. Well, there were plenty of warnings out there about how many runners will experience falls on the descent. I didn’t want to become a statistic. So I began my conservative pace thinking all was well. Next thing I knew, runners started streaming past me. I didn’t really care because I wasn’t about to change my strategy. About 2 miles down, I did another beautiful kick into a rock. Same foot and same toe. Oh man, I could feel some wetness in my sock now. With 10 miles to go, I had to keep moving and once again the pain subsided as other forms of pain took its place. About the 19 mile mark, I hit my low point. Runners were still passing me in droves as they seemed to float down the trail without any symptoms of discomfort. For me, my strategy of “controlled running” was killing my legs. I started feeling symptoms of the dreaded “wall” and combining that with the discouragement of getting passed so frequently, I decided something needed to change or I was going to crumple into a ball on the side of the trail. My thoughts also shifted to hating that I ever signed up for the race and even thought about never running again! My two choices were to give up and walk the rest, or let loose and fly down the trail with reckless abandon. I chose the latter. I can’t say it felt great, but it did wonders for my spirit. I was covering the remaining miles much faster and I didn’t have time to think about the pain because I was too afraid of biting it on the trail. One runner in front of me did just that…face first into the gravel and rocks. I stopped to help him get up and aside from scrapped knees and palms, he went right back at it. We later commiserated in the medic tent after the race! With a mile to go, I hit the paved Ruxton Ave that leads back into town. I started cruising down the road as fast as I could. There were many cheering spectators and it felt grand...until I got a nasty cramp in my side. I must have looked like a complete invalid running down the road hunched over, hand on my side, and my face screwed up like I had a mouthful of Sour Patch Kids. The cramp went away with only about 500 feet to go. I then went into my preparations for a flying finish line jump. What was I thinking? After the successful RnR Marathon jump with James, I wanted to attempt another one. I shouldn’t have. I launched into the air (all 2 inches off the ground), tried to grab my legs (which wouldn’t bend), and landed with an immediate buckling of the legs which sent me to the pavement below! I caught myself by planting my palms into the road and managed to save myself from a complete splat! I finished!!! 5 hours and 47 minutes after it began. I proceeded to sit with the throngs of runners waiting for assistance from the medics. My friend who bit it on the trail was right next to me getting his wounds cleaned up. The doctor came over and looked at my toe. He diagnosed me on the spot with a “stubbed” toe. They wiped off the blood and slapped a band-aid on and off I went to party! The party in the park across the street was first-rate. We lingered for several hours. Highlights included: spending time my three ladies, EATING, a twenty-five minute leg massage, cooling our feet in the creek, wearing my medal and new jacket that was awarded to all finishers, and just enjoying the “fall-like” weather. Well, there’s not much else to say that hasn’t already been said above. As with any marathon, this one was no different in that you end up learning quite a bit about yourself and what you’re capable of doing. The PPM had some really high highs (like standing at 14,110’) and some really low lows. Somewhere in between I experienced growth that causes me to get choked up when I think about it. Sir Edmund Hillary hit the nail on the head. I may have ascended & descended Pikes Peak, but conquering my fears, frustrations & self-doubt is what I’ll take away from this day. I’ll end this race report with an invitation to join me in my preparation and running of the PPM by watching a slideshow I put together. I carried our point & click camera on the ascent. All pictures were taken on the go, so expect plenty of subpar shots. I had to stash the camera on the descent because I needed my hands free in the event of a fall. If you've made it this far, thanks for reading!! 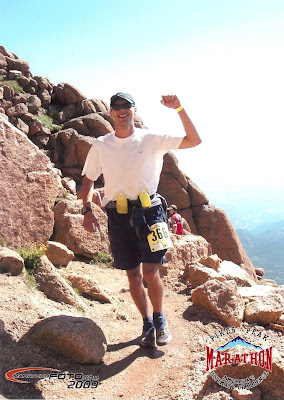 2009 Pikes Peak Marathon from CO Runner on Vimeo. This Sunday at 7am MDT, the shotgun will sound and I'll be joining 841 other marathoners who are crazy enough to try to run up and down Pikes Peak. After about 10 miles, I'll come out of the trees and make my way up the eastern face you see above. If all goes well, I'll have enough left in the legs to turnaround and begin the 13 mile descent back to Manitou. I guess I don't really have a choice! In preparing for Pikes, it's been fun for me to learn some interesting facts about the peak & race. Some of those tidbits are below. * This year the PPM is celebrating 50 years of women competing in marathons. Not that long ago, women were banned from marathoning. I read once that race directors thought that if a woman ran a marathon, her uterus might fall out! Well in 1959, Arlene Pieper ran the entire PPM and became the first woman to complete a marathon in the United States. Glad she picked an easy one! Click on this link to read more about her stroll up the peak. * The PPM (54 years) is the 3rd oldest marathon in the US. Boston (114 years) is on top, but can you guess #2? The Yonkers Marathon (84 years) in New York. Bet you never saw that one coming, but you probably never thought Pikes was #3. * The lyrics for the song "America the Beautiful" by Katharine Lee Bates were started as she stood atop Pikes in 1893. * Matt Carpenter, whom I wrote about when I ran in the Mt. Evans Ascent, will be defending his title. He's won the PPM nine times and is the current course record holder. Do you know what the course record is?? 3:16:39. Incredible. * The air on the summit contains only 60% of the oxygen available at sea level. Race rules state that you are disqualified if you're caught taking oxygen during the race! * 48% of the runners are from Colorado. The next largest percentages comes from Texas (9%) & California (4%). 43 other states are represented. * Most "flatlanders" will arrive in CO the day before the race. The preferred method of avoiding altitude sickness is to arrive and begin your journey up as soon as possible. * The average age of the runners in the PPM is 43. The oldest registered runner is 80. He's a "doubler" as he's running in the marathon AND the Ascent the day before. * Only 34% of marathoners are attempting the PPM for the first time. That means 551 runners have done this at least once before. One runner is going for his 44th PPM! * The average marathon finishing time for males in 2008 was 7hr10min. I'm hoping to finish somewhere in the 6hr to 6hr30min range. * Taken from Wikipedia - Some have pursued oddball feats on the Barr trail (12 miles one way), such as dribbling a soccer ball or walking backwards to the top. In 1929 Bill Williams of Rio Hondo, Texas, pushed a peanut to the summit with his nose over the course of three weeks. Some may think I'm crazy for wanting to run this race, but clearly there are those with much grander aspiration on the peak than I. Check back Monday for a race report. ...was last Saturday really August 1st?? I went on my final training run down at Pikes. My plan was to drive up the auto road to the summit and complete a "3-2-1" run. In this run, you start at the top and run 3 miles down & up, 2 miles down & up, and then 1 mile down & up. The total run is 12 miles...all above 12K feet. My plan was foiled when I got stopped 3 miles from the summit. They got a little snow on the peak overnight and the road had too much ice on it. They told me it would reopen in about 2 hours. Well, that wouldn't work, so I pulled into a parking area above treeline and found a different trail up. I had a feeling it was going to be an interesting day when a sign at the bottom read, "Summit Temp = 28 Windchill = 18". Thankfully, I was prepared with a headband to cover my ears, gloves, and a warm fleece. The run up went well, but once it got more rocky, the trail was very difficult to follow. Fortunately, there was a hiker much further ahead that left me his footprints in the snow to follow. When I caught up with the hiker, I found a 56 year old guy who was climbing is 51st 14er! He's only got two more until he's climbed them all! Well, we walked the final 75 feet to the summit and chatted. He was very encouraging & inspiring! When I ran down the Barr Trail on the eastern face, I bumped into another runner. We talked about the PPM and he told me that he ran it last year and finished in 4:15! That's insane! I looked him up when I got home and sure enough, he finished in 5th place. I also recognized his name. 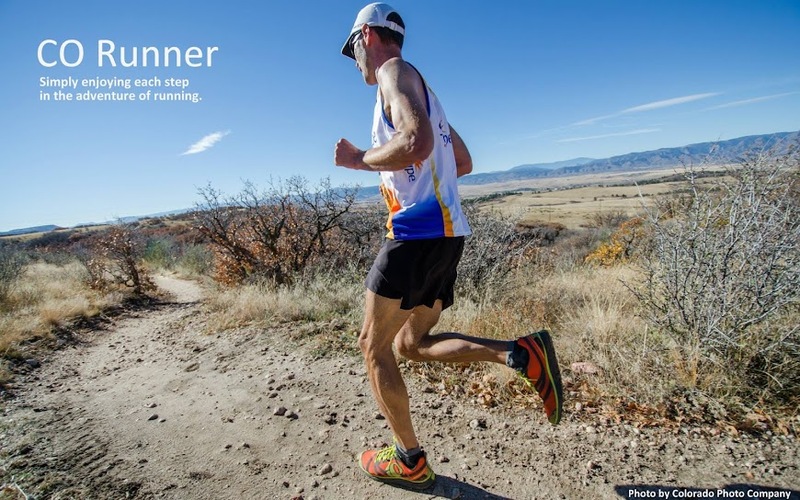 Come to find out he won the Colorado Colfax Marathon back in 2007. That was my first marathon.